Volume 2 of an anthology of pieces from the baroque to the present day chosen for their strong and memorable melodies, either written or arranged specially for the mandolin. Play solos and duets with a partner or with the accompanying audio. Standard music notation and tablature, with guitar chords. Tunes both easy and challenging, each graded for ease of playing. Detailed performance notes and technical tips. Background information and absorbing anecdotes make this an entertaining as well as an invaluable resource. 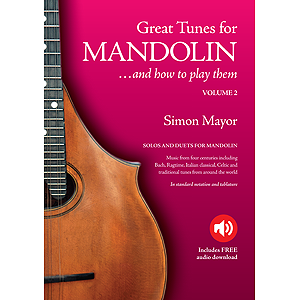 Whether you're taking mandolin lessons, following a programme of self-tuition, or just an occasional player, Great Tunes For Mandolin will provide you with repertoire and inspiration over time as you improve as a mandolinist. Instructions for downloading the audio files are given in the book. (opens new window in Simon Mayor's website).